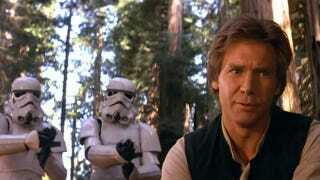 Harrison Ford to play Han Solo again; why does this make us sad? Please take this with the same large portion of salt that you've taken all the other Star Wars rumors with, but Latino Review says — on Fox News Latino, no less — that Harrison Ford is getting close to signing a "major" deal with Disney that would see the venerable and extremely cranky actor return to the role that made him famous, Han Solo. As usual, there are no details: whether he'd be back for Episodes VII-IX, whether he'd make an appearance in the rumored young Han Solo movie, whether he'd be a major player in all of them, or whether he'd get killed off in the first five minutes because Harrison Ford still kind of hates Star Wars. There's no telling, just like there's no telling if this deal is really going to go down. As a personal aside, does anyone else think bringing back any of the original trilogy characters is a terrible idea besides me? I literally have no desire to see old Mark Hamill, old Carrie Fisher, and ancient Harrison Ford in their iconic roles. The idea of seeing Han Solo shuffle around the Millennium Falcon and ease himself gently into the cockpit just sounds like the worst thing ever to me. I'd rather remember my childhood heroes as young and vibrant and badass and not hideously old. Honestly, I'd much prefer to have new actors cast as 40-something Han, Luke and Leia as opposed to getting the originals to repirse their roles. Am I alone in this? Does this make me a bad Star Wars fan?